Located in northwestern portion of Midtown Atlanta, the Atlantic Steel Tax Allocation District (better known as the "Atlantic Station TAD") was established in 1999 to facilitate the redevelopment of a 138-acre Brownfield site, which had been contaminated due to almost a century of heavy industrial use. Today this site is home to a vibrant, sustainable, mixed-use development which has made use of alternative transportation modes to minimize congestion, improve air quality, and connect major activity centers. Development to date includes approximately 1.8 million square feet of office, 2.3 million square feet of retail, a 101-room boutique hotel, 730 apartment units, and 1,485 for-sale residential units. In order to make the site viable for commercial and residential redevelopment, extensive public infrastructure and additional parking was needed, along with extensive environmental remediation due to the prior industrial uses of the property. 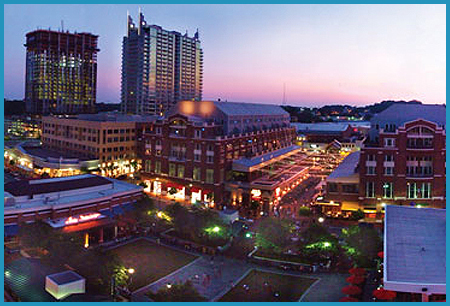 To fund redevelopment efforts within the Atlantic Station TAD, including public infrastructure, underground parking, and environmental remediation efforts, the City of Atlanta issued two series of TAD bonds totaling $243 million: the Series 2001 Bonds ($76.5 million) and the Series 2006 Bonds ($166.5 million). In addition, the City issued $85,495,000 as the Series 2007 Tax Allocation Refunding Bonds, which refunded the Series 2001 Bonds. Debt service on the bonds is secured by incremental real property taxes generated within the Atlantic Station TAD, as well as incremental taxes from business personal property and local option sales tax revenue generated within the TAD. Acting as the feasibility consultant to Invest Atlanta, the City of Atlanta's economic development arm, MuniCap has provided ongoing assistance in navigating the current financial and real estate market constraints, providing financial forecasts, evaluating repayment and restructuring options, and recommending the course of action that best allows the TAD to meet both current obligations and future goals.